It is our great pleasure to announce that Bev Kerr, President, St Vincent de Paul Society NSW Support Services and Vice President of the NSW Board, and Corrimal Conference member, has been announced as the NSW Senior Volunteer of the Year Award, as well as awarded the overall NSW Volunteer of the Year Award for 2017. Bev has been with the Society for over ten years in which time she has been involved in her local conference work helping people affected by poverty in the Illawarra region as well as a large number of projects including the construction of new buildings and services such as Freeman House and Edel Quinn. She has demonstrated a continued commitment to our frontline specialist homelessness services and the plight of people experiencing homelessness. Bev is president of the Matthew Talbot Homeless Support Servicess and also an active Vinnies volunteer in the Corrimal community. “I don’t get much of a chance to be with the Corrimal conference because I’m so busy with the state-wide responsibilities,” she said. Bev often works seven days a week, offering emergency assistance to the homeless, those affected by addiction, domestic violence or mental health issues. Bev has championed large poverty-targeted projects with the society, such as the design and revitalisation of Freeman House in Armidale, to provide residential and community-based programs for adults experiencing homelessness and/or addiction. Before retiring and commencing her volunteer role with the society in 2001, she worked for the Department of Community Services. 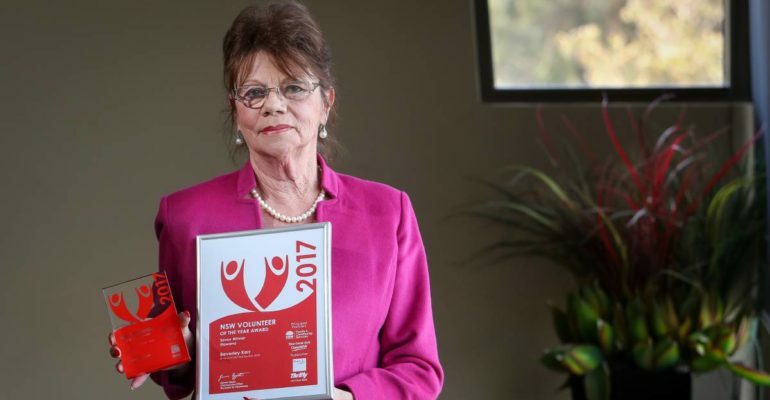 Earlier this year, Bev received both the Senior 2017 Illawarra Region Volunteer of the Year Award and the overall regional winner’s award for her work with the St Vincent de Paul Society.